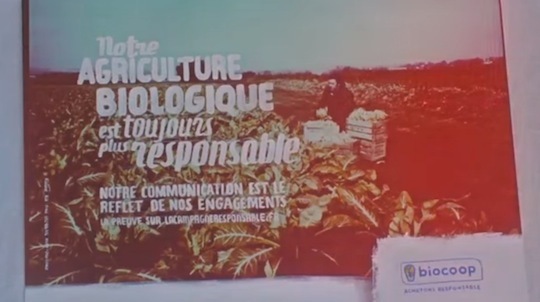 The owners of French organic food retailer Biocoop wanted the company’s latest advertising campaign to align with its environmentally-minded values – and they went to extreme lengths to achieve that goal. French organic food retailer Biocoop’s latest ad campaign may be the most eco-friendly ever created. The company’s owners worked with Parisian ad agency Fred & Farid to scrutinise every aspect of the ad campaign to make each step as environmentally friendly as possible. For a start, they travelled to location on bikes, and recycled as much rubbish as possible. But they delved much deeper into the production process to achieve their goals. The company’s poster advertisements were printed 25% smaller than the average – and after use were recycled into paper bags. The posters were shot using a homemade pinhole camera, which amounted to just a wooden crate with a piece of photographic paper inside, and the images were developed using recyclable chemical mixtures, with taglines and logos painted directly onto the pictures using vegetable paints. The company’s lightweight website – a total of 3MB in all – was created on a computer housed in a wooden box. The campaign was even announced by recycling other people’s tweets in a particular order. They made a short video on a hand-wound camera, as a study of how they produced their eco-friendly ad campaign. All up the campaign produced about three times less carbon dioxide emissions than a standard ad campaign, coming in at around 5.9 tonnes, according to their video.